Fresh food produce, it’s here! Apart of this “let’s eat” series, I’m making a stop at my local grocer each month to pick up the next seasonal produce in line and discovering ways to experiment with it. Saute, bake, or in a salad? There are so many methods. Let’s see how they each go! Anything lollipops is bound to be good. I love lamb. 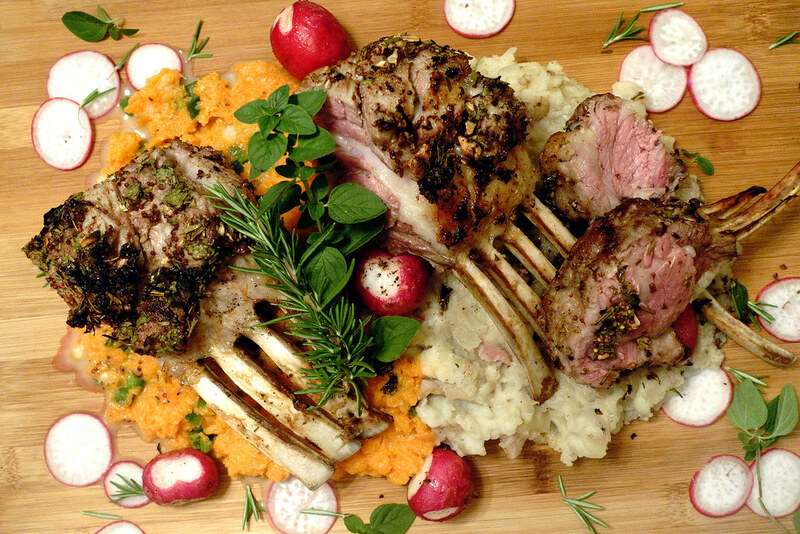 The extra step to turning regular ol’ lamb racks to the star of the show, lamb lollipops is with a method called ‘frenching’. This is to fully expose the bones to be the sticks of the pops, done by cutting through the fat. I, myself prefer the fat staying on but lamb lollipops are fun and cleaner to handle! 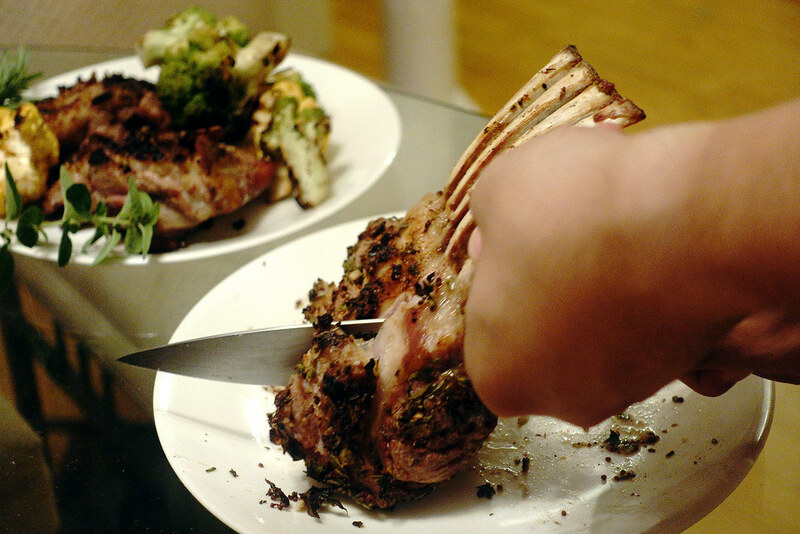 If you ask the butcher to french a lamb chop for you, you can keep the extra (best) piece for yourself – after all, you are paying for the whole thing. Tonight, we went the same ol’ route to crust our lamb. Since it was frenched, we had less surface space to work with. With a combination of chopped garden herbs (rosemary and thyme) as well as mustard, garlic and salt & pepper, it was ready for a roast in the oven. After the oven, a sear, and it was put on the side to rest then sliced to serve. For sides, we got experimental for the sake of colour. A bacon potato mash and carrot with jalapeno. I may have been stubborn this time around and took the seeds out of the jalapenos with my hands… Then rubbed my nose and took out my contacts shortly after. With no pain looking to be insight, I was burning, like little flames propped under my nose to suffer. The technique we used was reverse-searing the lambracks first roasting it then searing it. 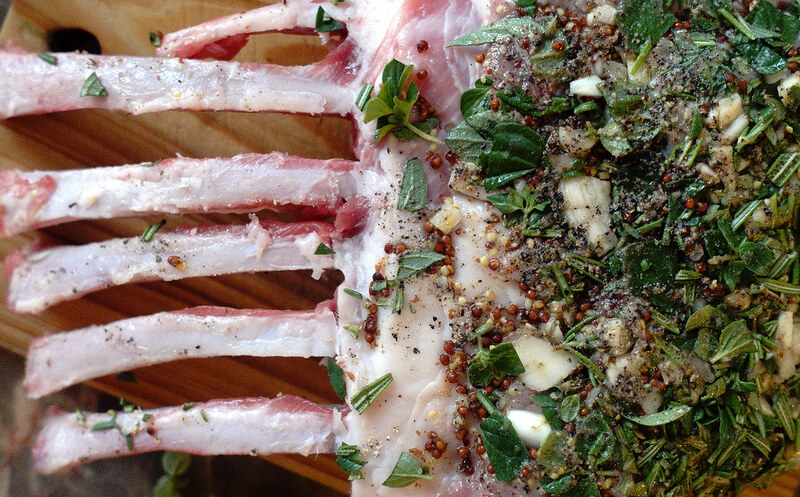 Generously coat lamb in seeded mustard, rosemary, thyme, oregano and salt & pepper. Set oven to 350. Roast racks for 15~20 minutes. Rest lamb for 10 minutes. Sear on each side for around 2 minutes each. Cube potatoes, boil until fork-tender. Cook bacon, set on side. With the bacon grease in the pan, wilt onions. Add salt, pepper and chili as you desire. Mash, add in milk and butter, more if you would like it creamier.